Leaked photos have appeared showing the S-70 being towed on an airfield, suggesting that taxi and flight trials are imminent. 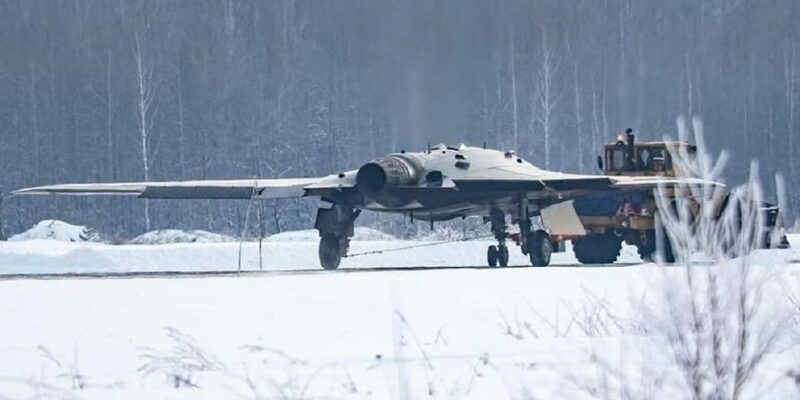 Earlier this week, several photos emerged on Russian military forums depicting a tailless jet-powered blended-wing-body aircraft. They are believed to be first images leaked onto the internet of the Sukhoi S-70 unmanned combat air vehicle (UCAV). It has been dubbed as "Okhotnik" (Hunter) or "Okhotnik-B," but that is more likely the name of the respective defense ministry program rather than the vehicle itself. The UCAV was depicted taxiing on a runway and being towed by a wheeled tractor, the latter allowing an estimate of its size. Outwardly, it bears a close resemblance to the Northrop Grumman X-47B, with a gross weight of around 20 tonnes and a wingspan of around 65 feet (20 meters). Apparently, the air vehicle is powered by a single AL-41FM-1 (item 117) turbofan, as installed in the contemporary Su-35S and Su-57 fighters. The UCAV employs a tricycle landing gear with a twin-wheel nose unit taken from the aforementioned Sukhoi jets. There is not much new in the aerodynamic configuration compared with Western UCAVs such as the X-47, Boeing X-45, or Dassault Neuron. It is likely, however, that the S-70’s aerodynamic control surfaces are aided by thrust-vectoring using the AL-41FM-1’s swiveling nozzle. If so, this would improve takeoff performance and maneuverability, increase combat range, and enable a wider center of gravity positioning, which is important with regard to the carriage of bombs and missiles in the internal weapons bay. At the same time, stealth features are somewhat compromised, as the jet nozzle protrudes from the otherwise sleek fuselage, thus increasing the vehicle’s radar and infrared signatures. While the S-70 is yet to have made a public presentation and a show debut, some limited information on the program has been available from official sources. In 2012, the Russian MoD named Sukhoi the winner in the competition for a heavyweight UCAV, beating RSK MiG, which offered the SKAT. It is interesting to note that Moscow’s decision to allocate funds for the project came in December 2011, shortly after Iran had brought down a Lockheed Martin RQ-170 Sentinel and demonstrated this 20-meter span reconnaissance drone, nicknamed the “Beast of Kandahar,” to local journalists. Reportedly, the Iranians managed to commandeer the American UAV and land it close to the Afghan border using Russian-made electronic warfare systems, and shared their finding, in a gesture of gratitude to the equipment supplier. Undoubtedly, the captured sample served as a source from which valuable information on advanced UCAV technologies could be extracted for further application on indigenous projects. Before that, Sukhoi had amassed only limited experience in medium-weight reconnaissance drones, into which it had begun studies in the early 2000s. The work was partially funded by the MoD via small R&D contracts, none of which progressed further than mock-up stage. RSK MiG was the first Russian manufacturer to go public with a full-scale mock-up of a contemporary UCAV, demonstrating the SKAT at MAKS’2007. For some reason, however, the defense ministry preferred to fund a larger Sukhoi design. Today, Russian armed forces do not operate armed drones, but the State Weapons Program 2018-2027 allocates funds for UCAV procurement. Current Russian thinking for future UCAV employment is that reconnaissance and armed drones would be used in a group, exchanging data among themselves through a secure datalink and assisting manned aircraft in the case of an armed conflict with a technologically developed opponent. Reportedly, an S-70 can be used as a smart wingman to the Su-57 and hit targets designated by the pilot in an automatic mode upon receiving authorization to attack. Many systems and weapons are unified between the two aircraft. Just before the leak of the S-70 pictures, a photo appeared of an Su-57 (Side 053) wearing two silhouettes on the fin: one depicted an Su-57 and the other a flying-wing UCAV. The Su-57’s underside digital camouflage was applied roughly in the same shape. It has been postulated that the Su-57, or another manned aircraft, might even be the “Okhotnik-A” within a wider manned-unmanned combination.